On Feb. 13, 1947, a crew of roughnecks struck black gold in a farmer’s field, launching a second oil rush in Alberta and confirming the importance of oil and gas in the province. 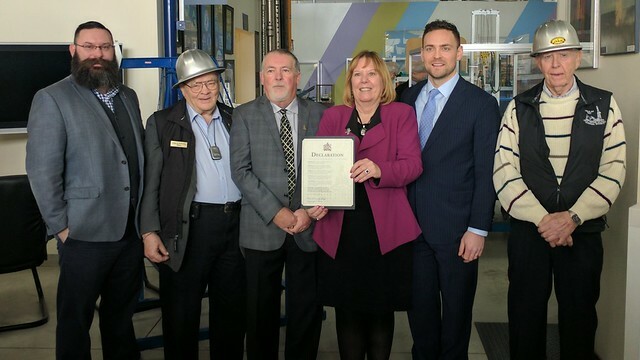 Municipal Affairs Minister Shaye Anderson; Dan Claypool (who worked on site 18 months after discovery); Tim Hawkins, President, Leduc/Devon Oilfield Historical Society; Energy Minister Margaret McCuaig-Boyd; Mark Scholz, President, Canadian Association of Oilwell Drilling Contractors; Don Hunter (son of Vern Hunter who drilled the discovery hole). On this 70th anniversary of the Leduc #1 strike, the Minister of Energy is recognizing this turning point in Alberta’s history by declaring Feb. 13, 2017 Alberta Oil and Gas Celebration Day. The discovery of wet natural gas in the Turner Valley in 1914 was Alberta’s only large-scale deposit area known until the Leduc # 1 strike in 1947. The Leduc-Woodbend oilfield was designated a national historic site in 1990. The Leduc Energy Discover Centre is located next to the original well head. 133 ‘dry holes’ had been drilled previously by Imperial Oil and the Leduc #1 site was considered one of the ‘last chance holes’ before investment was going to be halted. The oil strike led to the larger discovery of the Nisku Formation and numerous discoveries across the province. Leduc #1 produced an estimated 317,000 barrels of oil and 323 million cubic feet of natural gas before it was decommissioned in 1974. The Leduc-Woodbend oilfield has produced more than 300 million barrels of oil. In November, 2016, Alberta’s oil production reached its highest recorded levels at 3.5 million barrels/day.